Making: our house a home. Cooking: endives with ham and cheese (typical Belgian comfort food, mmmm) & banana bread! Drinking: water, water, lots of water. Gotta stay hydrated for the baby! Wanting: a finished thesis so I can be freeeee! Sewing: nothing YET but I'm waiting for my thesis to be done so I can start crocheting granny squares! Wishing: I could eat all the food in the world right now. Waiting: for my husband to get home so we can eat the deliciousness in our oven and finish our floors and mantle. Liking: how this house is starting to get a little better every day. Wondering: how our baby girl will look like and be like, what she'll love and what she'll dislike. Hoping: my thesis just magically gets finished. Marveling: at the movement in my belly. Needing: furniture. Or IKEA gift cards to buy said furniture. Smelling: cheesiness in the oven. Seriously, you should try this endives with ham dish! I'll try and share the recipe soon. 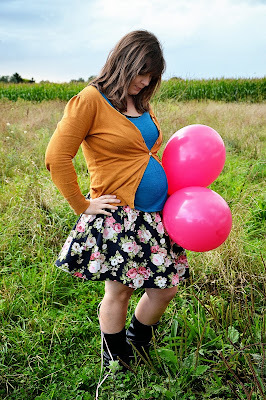 Wearing: pregnancy clothes and loving my bump in them! Following: my friends' updates on facebook. Noticing: fall is in the air. Knowing: my husband will be the best dad ever. Thinking: I should get started again with this thesis. Giggling: at the cute babyclothes I bought this weekend. They're all pink and cute and... Girly. There are some common themes to be found on this list. I guess that's my life right now and I just can't help but feel so incredibly blessed.